Welcome to Custom Shop, Inc. Thanks for visiting Custom Shop, Inc. We’re the home of the Outdoor Channel’s exciting show “The Gunfather”. You’ve come to the right place for great deals on the world’s finest guns. Custom Shop has some of the best guns to be found anywhere. Our buyers scour the country looking for rare and collectible guns. We chase down high-end rifles, pistols, shotguns, you name it! We grab them up and pass them on to you. If you don’t see what you’re looking for here, get in touch with us. We’ll work hard to help connect you with the guns you’re after. There’s always something new and interesting at Custom Shop. Custom Shop is always looking to purchase quality guns. We will buy one gun or your entire gun collection. Custom Shop knows the value of your guns. We pay fair prices and make quick payments. Custom Shop can also consign your guns. We will give them the attention they deserve! Custom Shop has a vast viewing audience through our website and The Gunfather TV Show, offering great exposure for your guns. We take the hassle out of selling! We’ll give you the fair and honest assessment of your gun’s value and advertise its best features. Our professional in-house photographer will capture the finest features your gun has to offer and present them to the buyer. 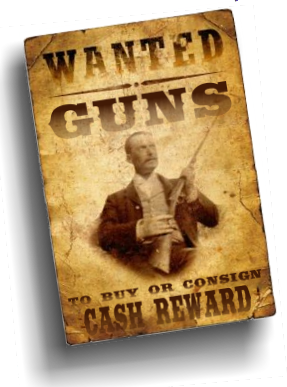 The buyer will see exactly what they are receiving and your gun will be showing off its very best. We work hard to connect your guns with the right buyers. Feel free to contact Custom Shop if you have something you would like to discuss selling. Custom Shop offers a range of services to help enhance your guns, restore and protect them from the elements, and maintain their value. Let Custom Shop help you bring out the best your guns have to offer and preserve their legacy for generations to come.